This is the house that I designed for a friend’s parents on a beautiful beachfront property on Nantucket. The challenge in the design was that the land was eroding. So I developed a strategy to have the house built in large components as a system. 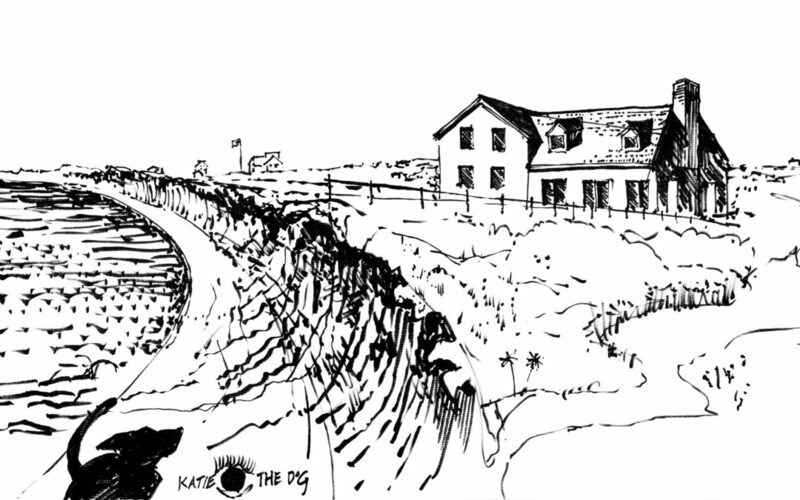 The system would allow the family or a future homeowner to disengage the large components and literally move the house back on the property away from the eroding vertical sand cliff at the water line. The American Institute of Architects (AIA) estimates that between 25 and 40 percent of the US solid waste stream is building-related waste. The AIA also estimates that only 20 percent of construction waste or demolition debris is recycled. [i] The component design strategy for the house is intended not only to save money for the homeowner but also to reduce the burden of adding to the waste stream. Reduce, reuse, and recycle starts with reduce and reuse before the more costly recycling efforts. This approach is rooted in waste reduction and material reuse. At a larger scale for residential home construction, builders and developers could take a more focused look at advancing modular and system-built homes. Homeowners, builders, and developers can also add indigenous species of flora around properties to help reduce erosion. Plants that grow well in a specific region are particularly important at shorelines. As an example, beach grass is ideal for sand dunes. In 2012, Hurricane Sandy devastated Seaside Heights in part because of the lack of proper sand dunes with vegetation. Author and illustrator: Charlie Szoradi is an architect, inventor, and the CEO of Independence LED Lighting. He writes about many other topics related to waste reduction and material reuse through his extensive travels around the world. If you have found this posting online, it is an excerpt from Mr. Szoradi’s book Learn from Looking that served as the inspiring seed content for this drawing share resource. For additional drawings and insights on cost-effective waste reduction and material reuse, we hope that you enjoy exploring LearnfromLooking.com. You can search via general terms such as sustainability as well as narrower terms such as waste reduction and material reuse as well as system-built houses.